Image by Jan Serr from page 99 in her upcoming book, THEN & NOW: CHINA PHOTOGRAPHS (2016). Smoke & Mirrors and Then & Now are books of painterly photographs. In both cultures there is a continuity of art and design, content and form, without the false dichotomies that divide and unfortunately permeate Western thinking, values, and practices. In India and China, the past is perpetually present. Serr worked on every aspect of the books—image, composition, typography, paper, and binding. Smoke & Mirrors and Then & Now are portfolios of photographs where the books themselves are the primary form of art. Smoke & Mirrors Introduction by Nishant Batsha. Release date is TBA via Plumb Press. 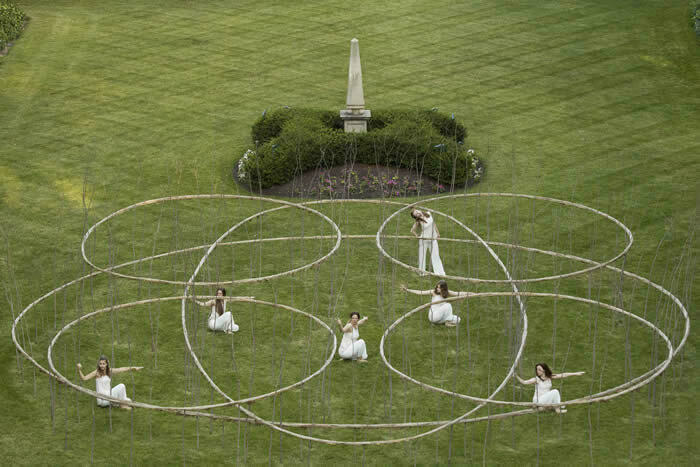 Milwaukee based performance group Wild Space Dance Company will perform Into the Garden this September at the Villa Terrace Decorative Arts Museum. Central to their performance will be artist Roy Staab's Shadow Dance, a site-specific installation in the Villa Terrace's Renaissance Garden. "Against the dramatic backdrop of Lake Michigan at dusk, intimate dance sketches and tableaus will unfold in and around Shadow Dance, the Scaletta d'Aqua, the terrace, and garden arbors for an unforgettable evening." The performance dates are September 8, 11, 13, and 14 with a rain date of September 18. For more information please visit the Villa Terrace's calendar page. To purchase tickets for the performances please visit the Wild Space Dance Company's website. Artist Roy Staab, of Plumb Press' publication Roy Staab: Suspended in Time, will be joined by Milwaukee based artists Gary John Gresl and Brent Budsberg for a panel discussion regarding environmental art at the Villa Terrace Decorative Arts Museum. This panel is in conjunction with the Villa Terrace's current exhibition featuring the work of Staab, Nature in Three Parts, running now through September 18. The panel will be held at the Villa Terrace on September 12 and will begin at 7:00 p.m. with questions from the audience to follow. For more information please visit the Villa Terrace's calendar page. A closing soirée will be held at the Villa Terrace Decorative Arts Museum to celebrate the close of Roy Staab's Shadow Dance featured in the Villa Terrace's Renaissance Garden on September 20 at 5:30 p.m. This event will not only be the last time to see the installation but also feature a performance of Wild Space Dance Company's Into the Garden​, which was inspired by the installation. There will be wine tasting, hors d'oeuvres, complimentary beer and wine, cash bar, and live music beginning at 5:30pm with the performance beginning at 7:15 p.m. The evening will also include a talk from artist Roy Staab as well as Wild Space's Deb Lowden before the performance. Tickets are $50 for non-members, $45 for Museum Members, and $40 for Young Friends 39 and Younger (limited availability). Purchased tickets online with Brown Paper Tickets here. For more information please visit the Villa Terrace's calendar page.